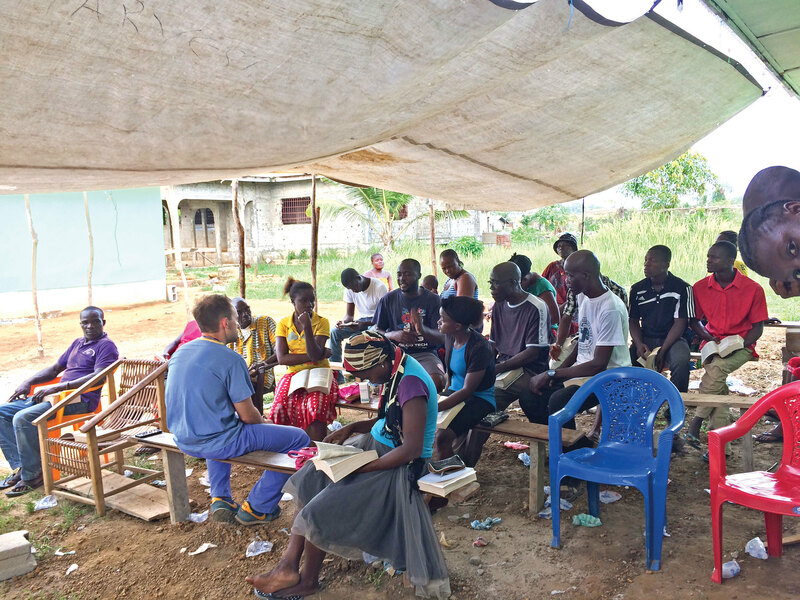 A temporary clinic in a suburb of Liberian capital Monrovia is bringing people to Christ in the most unexpected ways. The clinic, planned by American mission workers, Jen and Bill Nelson, and staffed by SIM UK doctors Ben and Caroline Saunders, sees about 100 patients a week. Ben, who is sent by Christ Church, Tunbridge Wells, explained: "When we arrived in Liberia the clinic had just set up. The plan was always that it would be used to advertise the new church plant in Boystown, a very poor part of the capital. The people do not have access to any free medical care at all, so the clinic is very much a way to bless them and point them to the church. We’ve set up in what could best be described as a half-built house. There are no doors, no windows and a corrugated iron roof – when it rains, it’s almost impossible to hear what anyone is saying. The patients turn up with all sorts of problems, some which need immediate hospital admission, others which are relatively minor and can be treated with the small range of medicines we have – things like mild malaria or chest infections. We probably admit three or four patients a week and we’ve seen four or five babies with neo-natal sepsis, a serious infection which needs immediate hospital treatment." At every consultation, Ben and Caroline offer prayer. That is almost always accepted with gratitude and gives Ben and Caroline, who will soon start specialist GP training in the UK, the chance to point the patient to Jesus. Ben, on a short-term elective at the ELWA Hospital, Monrovia before starting to specialise in paediatrics, said: "Most of the people we see are nominal Christians; a few are Muslim, but almost all of them still have very animist beliefs. The prosperity gospel has quite a hold here too, so very few people really understand the gospel. However, they are very open to prayer and believe in the power of prayer. We are able to pray with them and make it clear where we believe true healing comes from." All the patients are told about the new church plant, which started at the beginning of 2017. The clinic is always followed by a Bible study at which all are welcome. Very much a leap of faith, the plant was set up by Pastor Abel from a church nearer the centre of Monrovia. He has moved his wife and children to Boystown and has sold almost everything the family owns to get the church started. Ben said: "He is a remarkable man, who has demonstrated great faith in setting up this church. They meet in the open air, under a tarpaulin slung between two buildings, but their numbers have been slowly growing. We really hope that people will make the link between the care they receive at the clinic and the church. We try to tell the patients about the church and encourage them to attend." Ben and Caroline are running the clinic in their free time and they know it will probably come to an end when they return to the UK. Their great prayer is that the church will continue to grow and flourish, even after the clinic has closed. Ben said: "It’s great knowing God is using us and what we are doing to bring people to him. We are seeing his grace at work every day and we know God is saving souls. It’s amazing. To see the faith of Liberian Christians has been a huge challenge for us — the way they pray with such great faith and expectant that God will act. It’s so different from the way most British people pray but hugely refreshing. We are so grateful to God that he has been able to use us in this way." Alfred turned up at the clinic with a growth on his neck and wanted an operation to remove it. Serving In Mission doctor Ben Saunders offered to pray with him. Through the prayers, Ben told Alfred how much Jesus, the true source of all healing, loved him. Ben referred Alfred to hospital and the growth was removed. Alfred, who is in his 30s, is very grateful; eternally grateful you might say. Ben explained: "Alfred said he had been struck by how kind everyone had been — he said he had never had such kindness from Muslims. He started meeting with Pastor Abel (below centre, with Ben and Caroline left) and was eager to learn more. Even though he cannot read or write, he wanted a Bible. A couple of weeks later he said he wanted to follow Jesus — and he is. He’s going to church regularly."